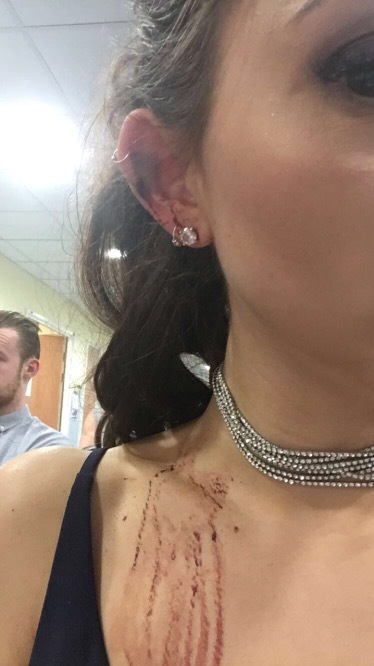 So I’m taking a break away from documenting my travels to review a tattoo and piercing studio in my home town Nottingham, in order to prevent this from happening to anyone else. 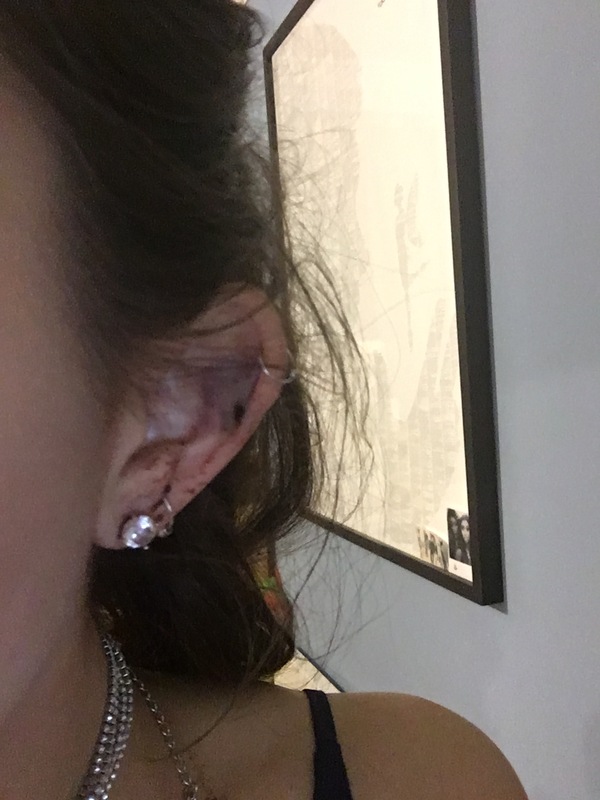 I had my first cartilage piercing here when I was 17- so I thought it would be a good option to get another. Tuesday I finally went to get it done- the piercer, looked where I wanted it and said- ooo you’ve got a vein there. But don’t worry I’ll miss it. What I would discover days later is that he did not. It was fine for the first day and evening, then it started to get a huge bruise around it, which was going quite black. Then Wednesday evening I went for dinner with some family and the piercing just started bleeding. Light but constant until I went to bed that evening. I passed it off as me irritating a new piercing. Until the next evening when it did exactly the same. 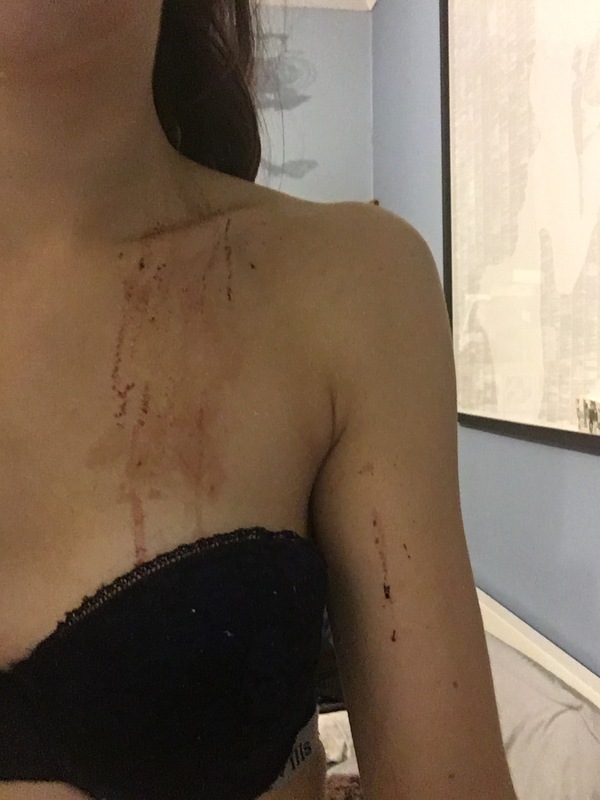 Now, it was starting to get concerning- I’d wake up to blood on my pillow and Friday night took a turn for the worse. 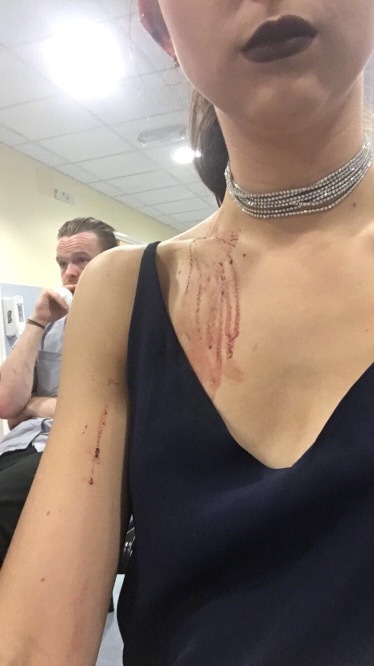 I’d just met some friends for a drink, about 10 minutes in, they pointed out that it was bleeding, not just bleeding, pouring. 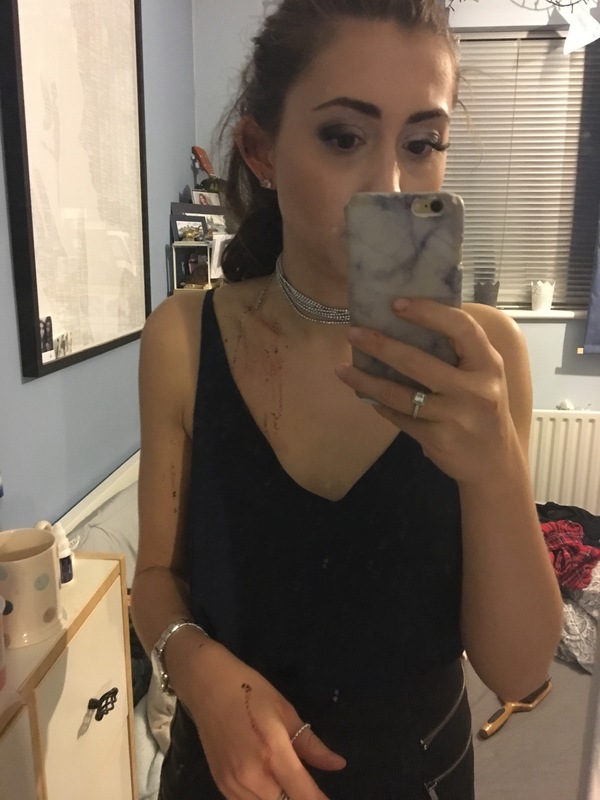 It kept dripping down onto my neck, onto my top and skirt, it was bad. To the point where my dad had to come pick me up after enduring it for nearly an hour. Hero Daddy to the rescue. I showed him, and he suggested, along with my friends, that I should take it out so it could heal. 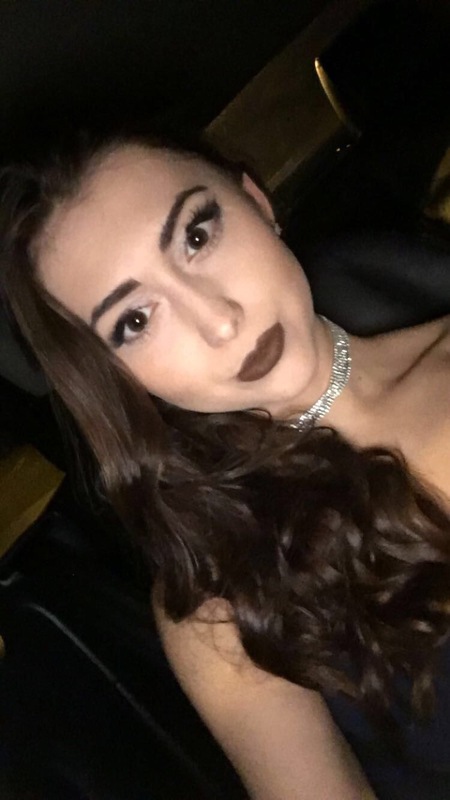 So of course, I sat there in the car- after 3 attempts, got the piercing out and it was safe to say I shouldnt have done it. In a matter of seconds, my ear was burning, and it was as if I’d turned a tap on. I counted, 6 seconds and it had drenched through the wad of paper towels I had and was running down my neck and chest. 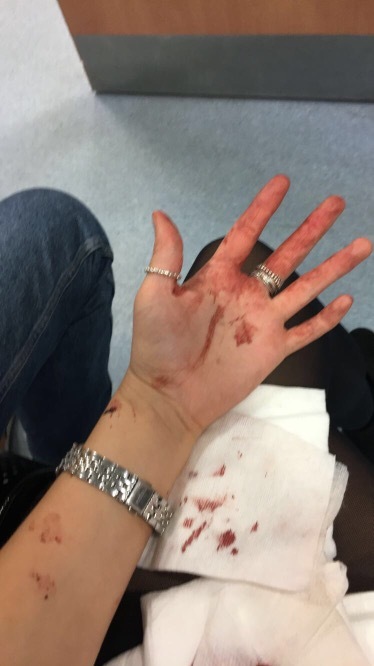 It would not stop bleeding to the point where we ended up in A and E.
I walked over to the front desk with blood soaked hand towels, dripping blood onto the floor (gross I know) and even the lady at the front desk couldn’t believe that this was caused by a tiny piercing. She got me some gauze and the wait began. We were there for 3 hours, all the time bleeding- it eventually clotted just before I got in to see the nurse. After nearly 4 hours of pouring- it had finally stopped. Bare in mind this was as it had almost stopped 3 hours in- it was so gross. And the best the nurse could do was say, don’t knock the clotted blood off and let it heal… greaaaaaaat. I explained how much it bled, so she gave me things to clot the blood of I accidentally took off the scab but still- even the nurse had said she’d never seen it before in all her years of working as a nurse. If you’re planning on going for a piercing- please please please don’t go to Access all areas, body craft are much better, more legit and professional. 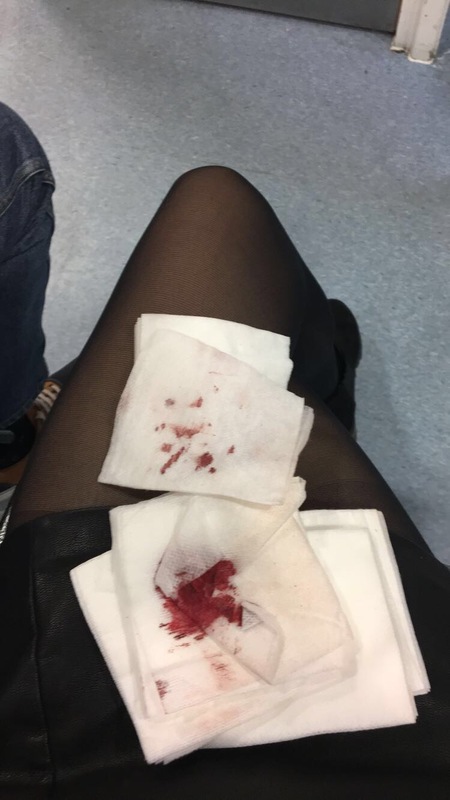 I’m trying to raise awareness so that no one else lands in A and E, so please take care!